Where does your company stand today? Defining objectives and measuring discrepancies is only possible if all the facts are known. After discussing your requirements, we’ll perform an integrated performance check to examine all your company’s relevant indicators. Based on these results, we will then be happy to suggest ways of enhancing performance. A business only enjoys consistent success if it’s customer-focused. Which is why, depending on your company’s background and after liaising with you, we’ll develop long-term strategies. Performance indicators can be improved in the short term, but it’s these strategies that will guarantee healthy development based on a customer-centric approach and a strong company. As even the best of strategies will fall flat if not firmly anchored, we’ll supervise their top-down implementation from corporate- to departmental-strategy levels. Communications specifically directed at employees ensure that they endorse the objective and the roadmap chosen. As a result, everyone heads in the same direction and success gathers steam. Companies arrive at strategic turning points more and more rapidly. Business models, departmental strategies, products and services or processes have to be examined and adapted in ever shorter cycles. This is caused by new trends & innovations, the loss of focus on the customer along with crises resulting from a misguided corporate culture or inadequate communication. When an organization fails to make an important adaptation, it loses its viability for the future and its competitiveness. We work with you to resolve these issues, to determine the required changes, the precise strategic alignment, the new structures along with the conceptual feasibility and how to safeguard the success, in line with the maturity of your organization. In collaboration with our customers we also investigate the strategic adaptation to the digital reality (industry 4.0) – a critical factor for the every company’s future. The digital transformation requires guidance and a systematic foundation throughout the entire organization. 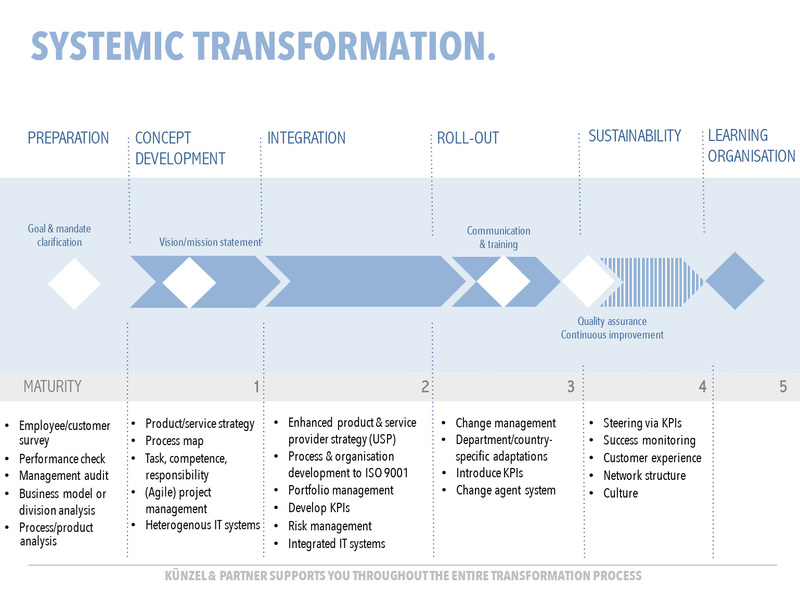 Künzel, Drews & Partner Management Consulting supports the entire transformation process in order to access efficiency and effectiveness potentials throughout a company’s complete value chain. Projects need exemplary management so that everyone is motivated to do what they can and not just what they want. An impartial look by someone outside the company means up-and-coming tasks can be observed in a target-driven manner and existing potentials are seen objectively. It also broadens horizons. We use our experience to develop productive teams for our customers and lead the projects to success. In contrast to traditional project management, we save up to 30% on costs and time and boost project members’ motivation too. SCRUM is a project-management method that allows complex projects to be managed flexibly with little red tape, fewer rules and roles. Project members and stakeholders take centre stage instead. Results are produced in what are known as sprints. This means that project tasks are broken down into small and very small work packages, which can be processed and checked in short periods of time. Consequently, we can empower your teams to complete even critical projects successfully and get the relevant stakeholders on board. To do so we provide training in SCRUM Master, Product Owner and Development Team roles and accompany your projects until they reach their goals. We know the conflict between strategic demands and putting these into practice: on the one hand, it’s all about creating the right focuses in the strategy to provide maximum benefit to the project’s overall success, but on the other hand it’s also all about putting these into practice in a resource-friendly and timely manner. The wide range of projects and responsibilities that have to be handled simultaneously today are a huge challenge on their own. The impact of external and internal factors, or glitches in workflows, quickly exponentiate complexity. In this case, an effective and solid project cockpit is required that enables well-grounded decisions to be made. We will join forces with you to produce foundations and a data set, develop the process model, identify suitable control methods and define each of the roles and responsibilities. We will then help you reflect these parameters in the data-management system and come up with access and authorisation concepts. Efficient processes enhance productivity. Yet when the parameters change these processes need to be optimised or re-established from the ground up. We utilise our method expertise to focus on our customers’ goals and maintain lean processes. Changing conditions generally require optimised or new, specifically developed processes – while minimising the time involved and maximising acceptance among employees. We are at home in this situation. We work hand-in-hand with the management and those involved to develop effective, successful and better solutions, ranging from aligning the requirements with existing processes or the value flow design method to adapting or developing new concepts up to and including the successful introduction and communication. Utilizing the Lean Management 2.0 philosophy and ISO 9001 standards, we work to optimise your organisation and guarantee successful auditing. The system-side implementation of processes is often a science in itself. A heterogeneous system landscape, unique IT language along with the discrepancy between the technical options and the practical usage often make implementation a challenge. We create models based on lean standards and develop feasible specifications while maintaining an overview of the programming and usage. Optimisations can only succeed over the long term when proper training in the systems is provided and the procedures are truly put into practice. Changes occur every day – whether intentionally or by chance. Uncontrolled change is chaos. Utilizing effective and sustainable oriented change concepts, we put our customers in control of their change processes while also bringing the team on board. Change processes require time and attention. The more important the change, the longer the time until completion and, thus, the more important the attention from the management. Successful concepts monitor key factors such as this and provide a precise schedule for the implementation together with measurable milestones. At the same time, we work with you to create the foundation to transparently and credibly communicate the necessary changes. This creates acceptance and provides the staff with a sense of security. Whereas the large number of (change) projects leave companies with barely enough time to successfully complete them, our customers value our consistent and sustainable implementation. The change project is successful when the change has become a reality. This is the benchmark which we measure ourselves against.